WILMINGTON, NC (WECT) - They say if you don’t like the weather in North Carolina (or anywhere for that matter) just wait a day and it will be a completely different season. That statement has held true for southeastern North Carolina for the past week. Temperatures were forecast for the seasonable upper 50s and low 60s. They were then expected to grow to the lower and mid 70s, mid to late week. Actual high temperatures went a few degrees above and beyond the forecast highs, but little did we know we would see the first 80 degree reading of 2019! 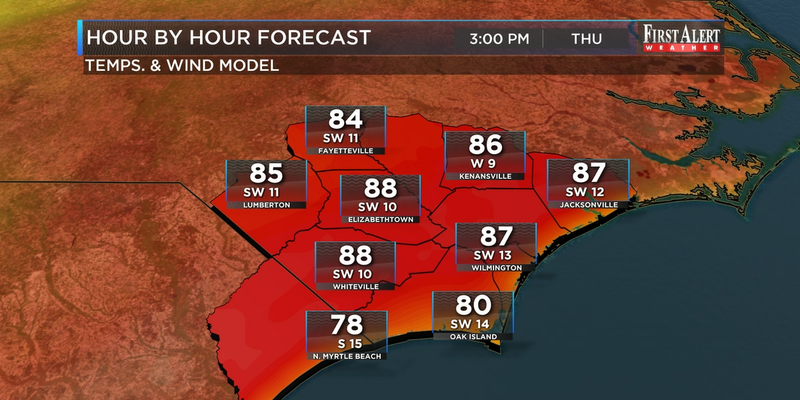 Thursday, Wilmington, set a record high temperature of 82 degrees, shattering the previous record for February 7 of 75 degrees, set back in 1989. Friday’s record high of 77 degrees from 1932 was also broken. Temperatures for the day reached 79 degrees. Rainy days have been few and far between. The past 8 days, rain totals have only measured .16”. Normal rainfall for the month to date is about one inch. This comes off of a January that featured below-average rainfall. But all good things must come to an end. The week Ahead features colder wintry temperatures, in the 50s during the day and 20s and 30s at night Saturday and Sunday. Rain chances should begin to grow early next week while temperatures flirt with 70 degrees once more.